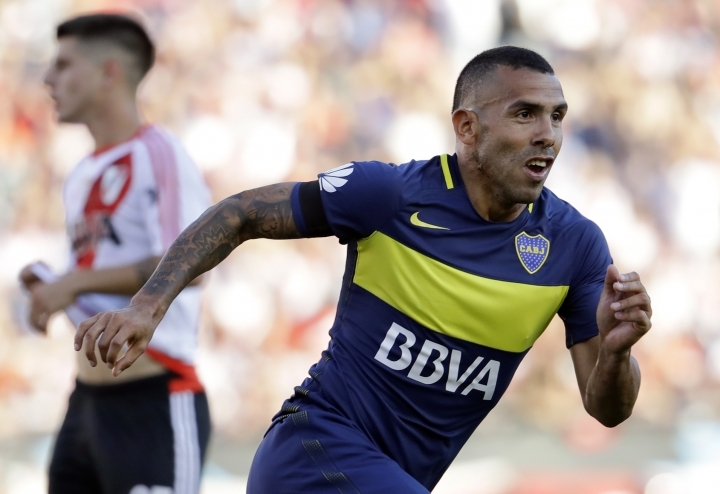 BEIJING — Argentine striker Carlos Tevez has signed to play for Shanghai Shenhua, becoming the latest in a procession of star players to join the Chinese Super League. Shanghai Shenhua said Thursday that it paid an $11 million transfer fee to Argentine club Boca Juniors. A person familiar with the negotiations said the 32-year-old Tevez would be paid $40 million over two years. The source spoke on condition of anonymity because he was not authorized to divulge details of the transaction. Tevez is expected to join team training on the Japanese island of Okinawa next month, with a formal introduction to follow soon afterward. The next Super League season begins in March. Chinese clubs have spent heavily over the past year to attract mainly South American stars. Last week, Shenhua's city rival Shanghai SIPG sealed a deal with Oscar from Chelsea. Other stars to join Chinese clubs include the Brazilians Hulk, Ramires and Paulinho, Colombian striker Jackson Martinez and Argentine forward Ezequiel Lavezzi. Tevez will be coached by Gus Poyet, the former Sunderland and Real Betis manager who became Shenhua's manager in November. Other internationally recognized managers in the Chinese Super League include Guangzhou Evergrande coach Luiz Felipe Scolari, Shanghai SIPG coach Andre Villas-Boas, and Hebei China Fortune's Manuel Pellegrini. China's government wants to turn the country into a football power, setting the goal of having a team capable of winning the World Cup by 2050. Leading the national team is Italian coach Marcello Lippi, signed earlier this year to a hefty contract of his own. China has also invested in youth soccer and building stronger pipelines to develop homegrown talent. But the Super League's shopping spree has raised eyebrows and alarmed major European clubs who previously had no rival in attracting the world's top players. Antonio Conte, manager of Chelsea, said earlier this month that "the Chinese market is a danger for all." Tevez has appeared in two World Cups for Argentina and previously played for Manchester United, Manchester City and West Ham United in the English Premier League, as well as Italy's Juventus. Tevez moved last year to Boca Juniors, the club where he began his senior career, after helping Juventus win its fourth straight Serie A title. But he was quoted in the Argentine press this year saying that he was unhappy and even contemplating retirement. Associated Press researcher Fu Ting in Shanghai contributed to this report.